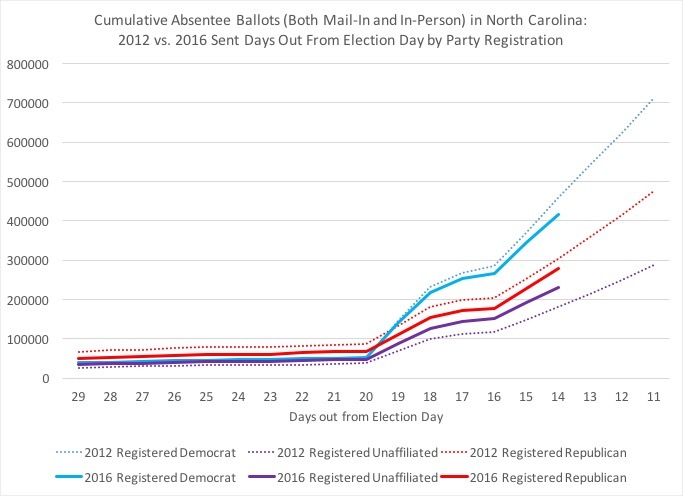 As we enter almost a week of in-person absentee (early) voting in North Carolina, the combination of both in-person and mail-in ballots is getting very close to one million total absentee ballots cast in the Old North State. 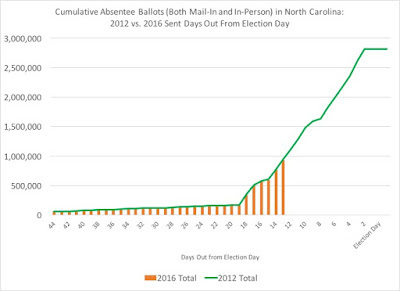 Currently, this year's total is 2 percent behind where we were in 2012 (943,088 total absentee ballots were at this same day four years ago). 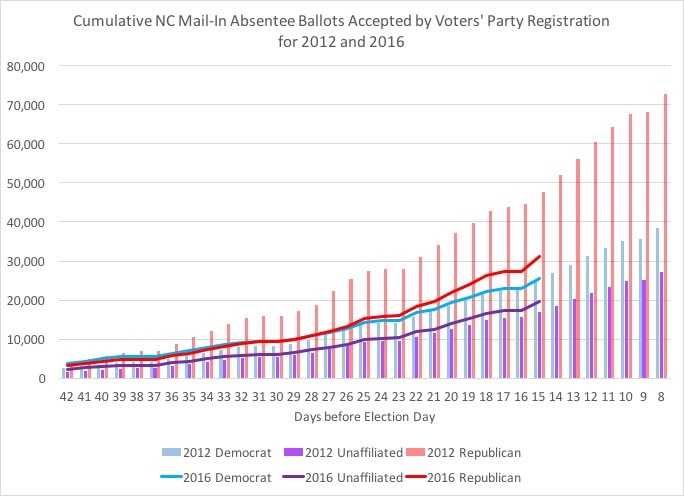 In breaking down the trend lines by party registration of the total absentee ballots (again, counting both mail-in requests and in-person ballots), the party registration figures show a distinct difference between this year and 2012's trend lines. 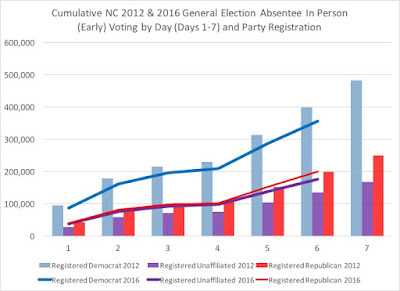 While both registered partisans are running behind (both registered Democrats and registered Republicans are nine percent behind their 2012 same day totals), registered unaffiliated voters are 28 percent ahead of where they were four years ago this same day. 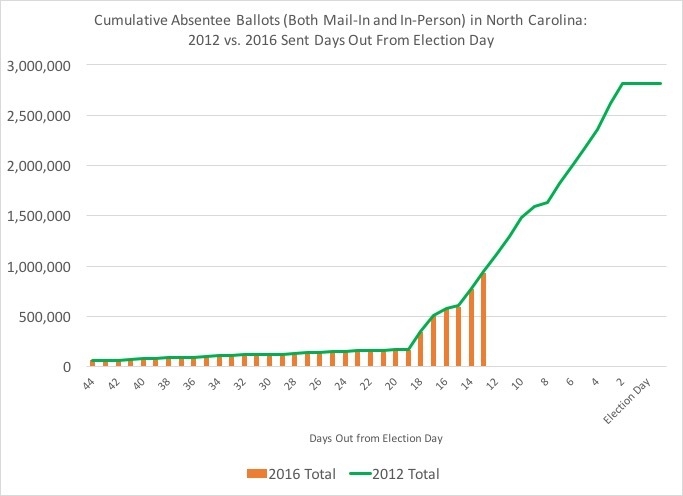 In comparison to the 2012 cumulative totals, this year's in-person absentee ballots are where things stood four years ago (733,269 compared to 2012's same day total of 733,745). 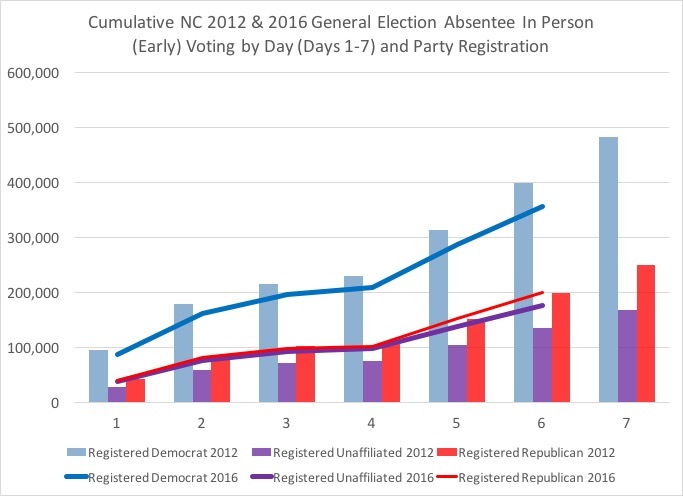 In terms of party registration performance, registered Republicans have met their same numbers from four years ago, while registered Democrats are down 11 percent, and registered unaffiliated voters are 30 percent ahead of where they were the same day in 2012. 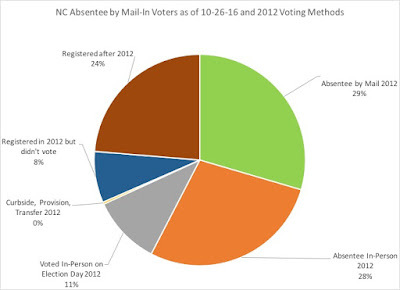 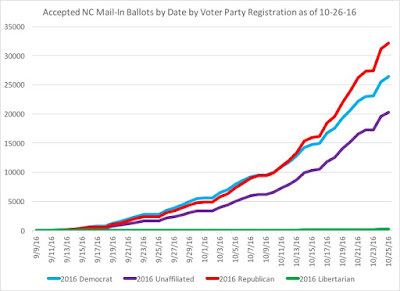 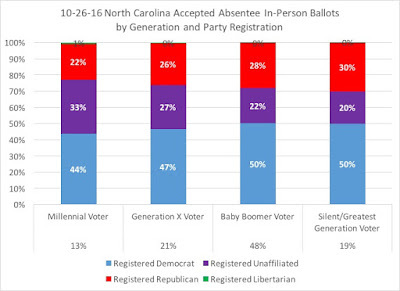 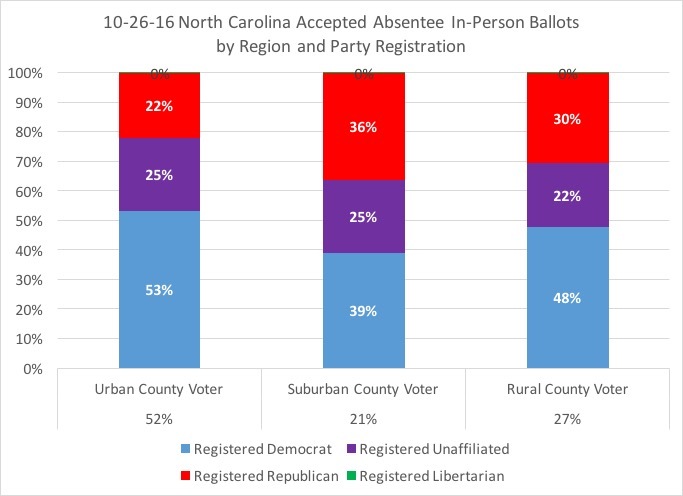 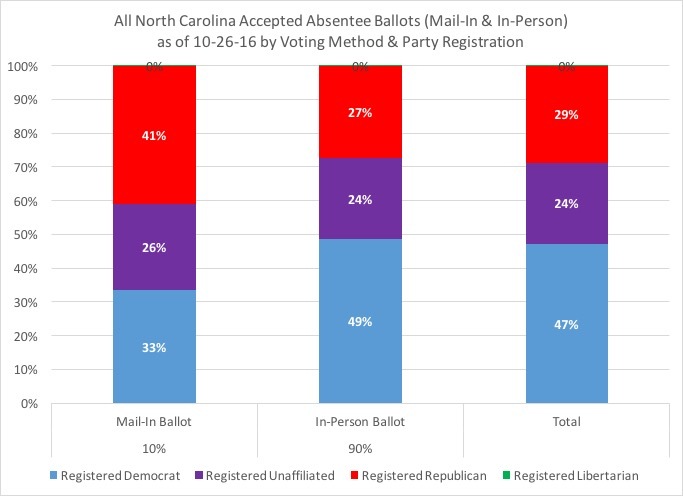 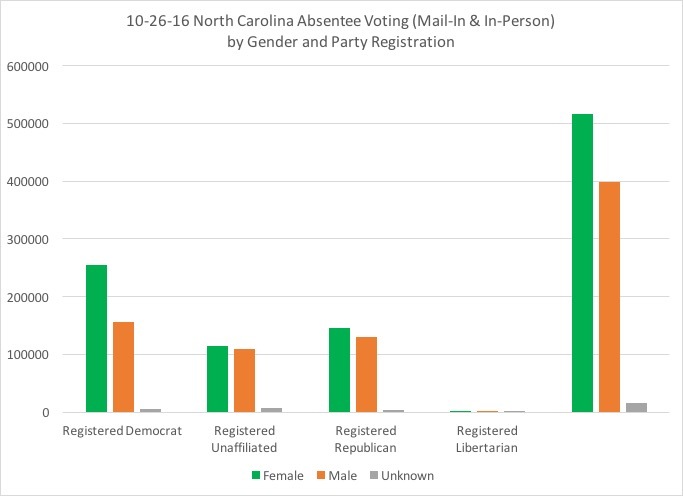 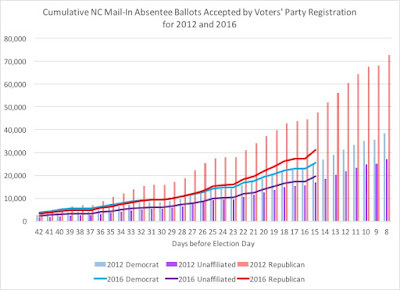 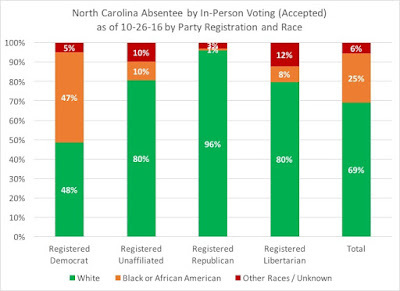 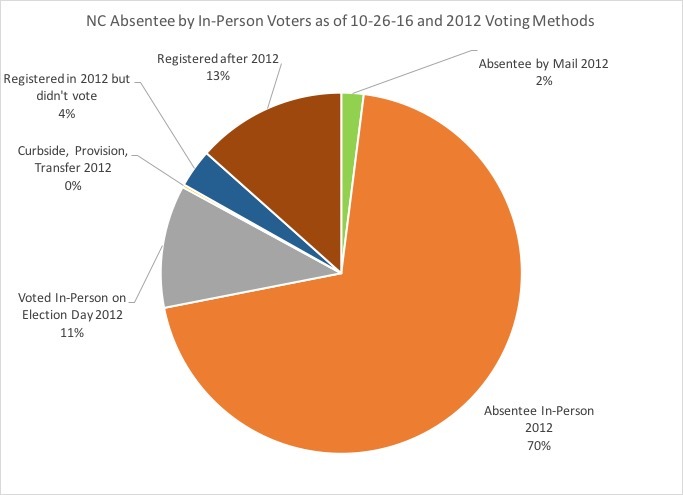 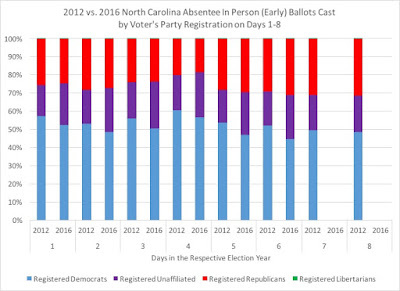 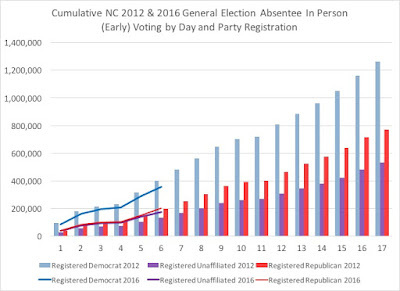 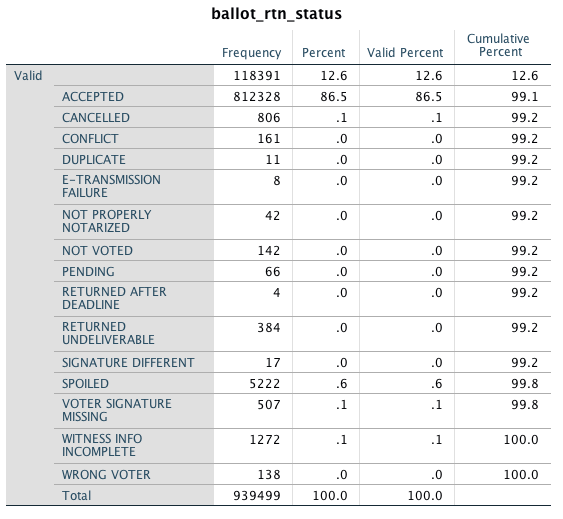 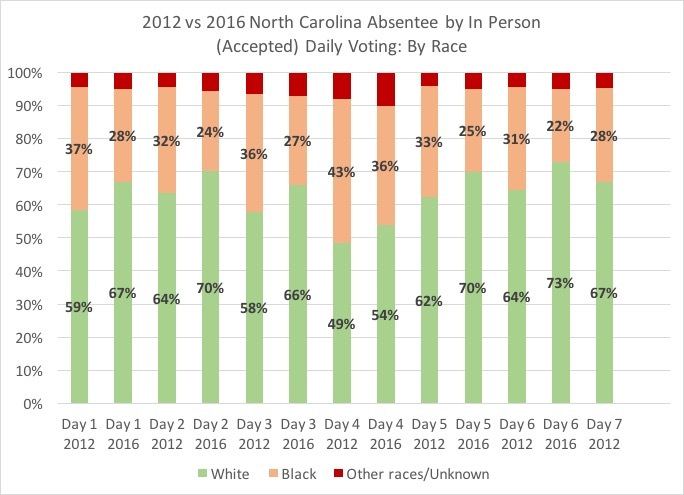 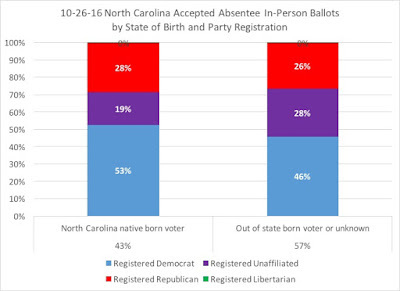 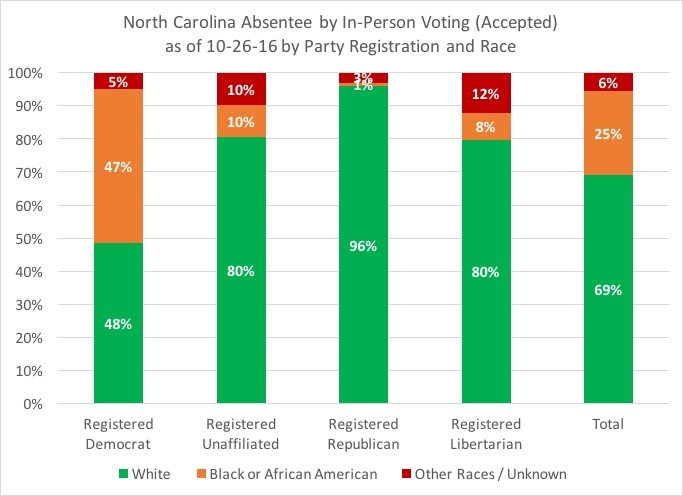 UPDATE: the following graphs look at the mail-in absentee ballots so far in North Carolina. 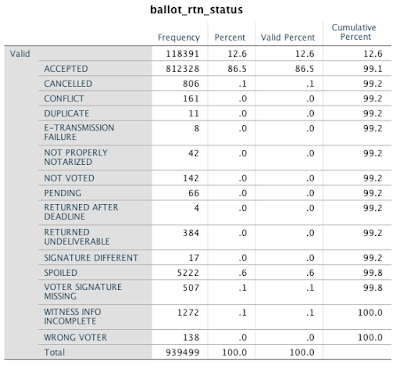 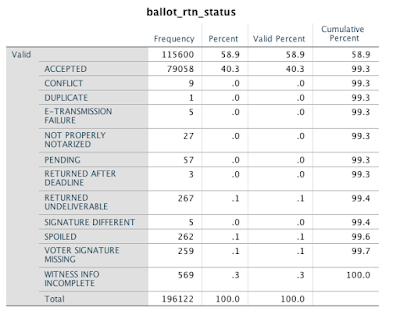 With over 196,000 mail-in ballots and over 79,000 of them returned and accepted, here are the various break-downs by party registration and other information. 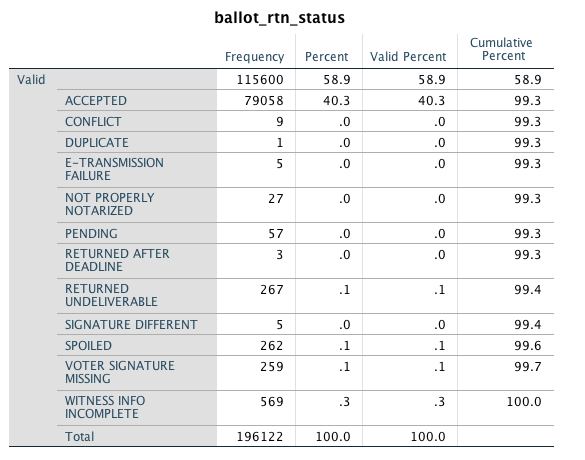 The acceptance rate for overall ballots is currently 40 percent, with registered Republicans at 41 percent, registered Democrats at 43 percent, and registered unaffiliated voters at 36 percent. 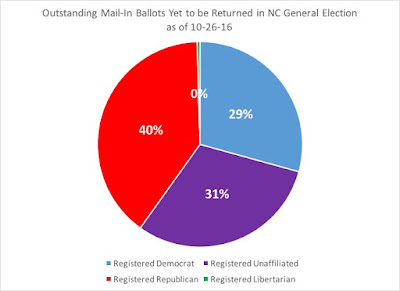 Registered Republicans are 41 percent of mail-in ballots, with registered Democrats at 33 percent and registered unaffiliated voters at 26 percent. 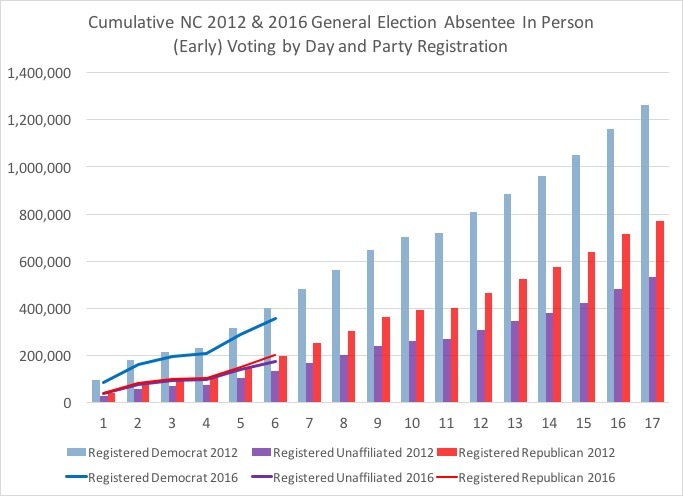 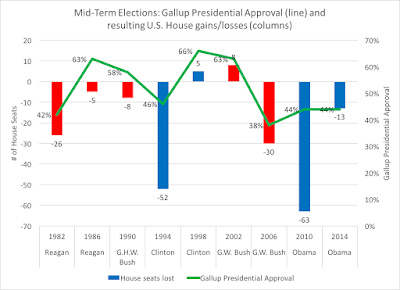 However, in terms of party registration and performance, there is a significant decline in registered Republicans utilizing this voting method in comparison to 2012. 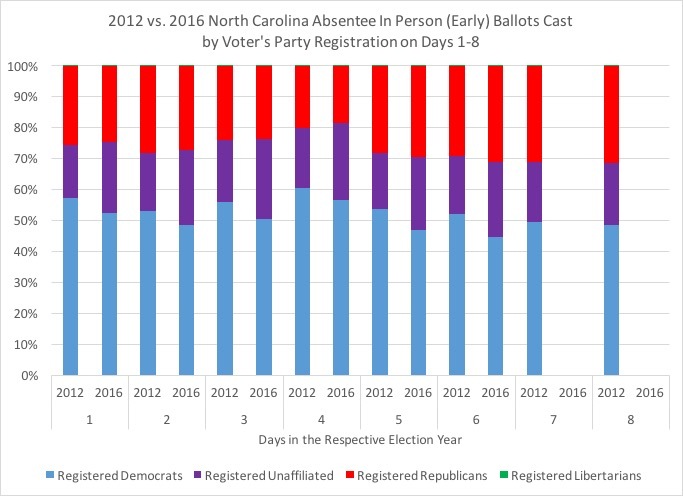 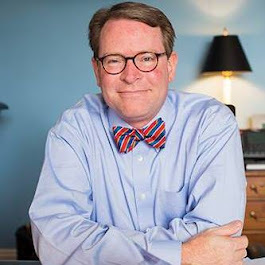 Registered Republicans are at 62 percent of where they were this same day out of the election in terms of returned and accepted ballots, whereas registered Democrats are slightly behind (98 percent) and registered unaffiliated voters are ahead (109 percent), with overall numbers being 81 percent of where they were four years ago.